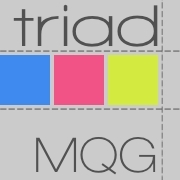 Triad Modern Quilt Guild: Kim Lapacek is Coming! We are thrilled to have Kim Lapacek of Persimon Dreams join us! Pull out your fun scraps and turn them into a unique Dresden Neighborhood! We'll put a whimsical 'twist' on the traditional Dresden Plate, cutting, piecing, applique and stitching to make an adorable wall hanging! Once you learn Kim's techniques, you'll never look at a traditional block the same way. Both events will be held at South Fork Community Center on Country Club Road.